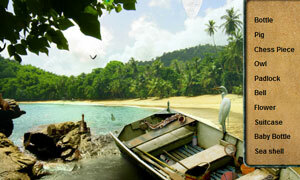 Rescue at Rajini Island is a another online hidden object game by brutomemo. Embark on an epic adventure into the unknown as you search for Captain Walsh and his missing crew of adventurers; lost on an uncharted Island. Explore ancient ruins and search for evidence of a lost civilization. Have fun.